The 2016 Release of this 12 Year Old Cask Strength has been matured in 70% Sherry Casks and 30% Bourbon Casks and bottled at 56.3% ABV. 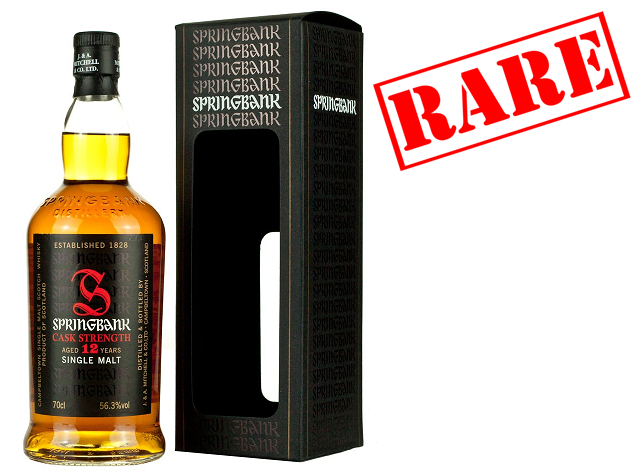 Springbank has an excellent reputation, combining the distillery's rustic charms and quality sherry casks. A splendid Campbeltown expression, this is the 12th batch produced and is limited stock! Nose: A wonderful concoction of nuts, toffee and marzipan among softer notes of coconut, creme brûlée and honeycomb. Palate: A beautiful balanced dram with further notes of honeycomb along with toffee cream, chocolate, dried fruits and raisins. Finish: Long, big and gentle with traditional dunnage warehouse notes accompanied by sweet salted caramel and maple syrup.